However, Windows operating system provides a great windows utility program for formatting any pen-drive or other storage device But sometimes that does not work in some cases. In these cases, Users might be allowed to format in either FAT32 file system only or not allowed at all. So, What will the users do in these cases? If we consider in case of "virus" in pen-drives, then we found that sometimes pen-drives are infected with virus and are not cleaned after formatting many times. So, what can we do in this case too? Have you tried to format your pen-drive with cmd prompt ever? 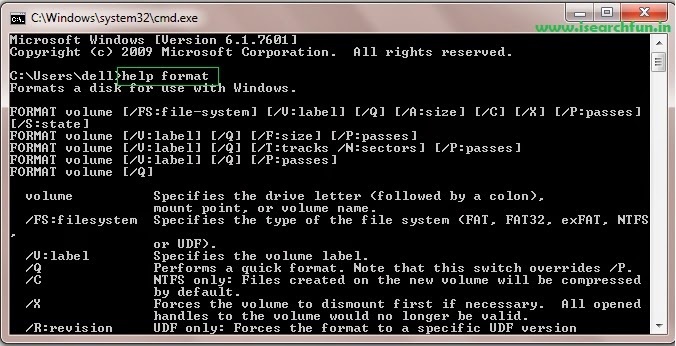 I think, you should give it a try to format your pen-drive with command prompt. Here, we will discuss the steps involved in formatting a pen-drive with cmd. You can also specify the file system either FAT32 or NTFS either after formatting or before starting the process. First of all, Insert your pen-drive into your system. In run box, type cmd and Press Enter. Change the drive letter as noted in step 2. Now, press Enter and again Enter to confirm. Wait for sometime and then command prompt will ask you to enter a drive name. Type the drive name and then Press Enter again. That`s all you have to do. We only used a simple command "format" to complete our process. I will suggest you before formatting, use " help format " command. it will list all the possible commands which can also be used to specify certain things. You can also convert the file system from FAT32 to NTFS after formatting the Pen-drive. It is noticed that the data remains safe and unchanged but you should store your data also on some other safe place before proceeding. Change f: with the drive letter of your device. Conversion process will be completed after some time. You can check the Properties to better sure about your data. This was the effective way known to format your unformattable Pen-drive in either FAT32 or NTFS file system. Have you ever tried this way? How much was it helpful? Share with us.